The only thing more exhausting then a Tier 5 warzone push, is two in one weekend. For the first time since Inferno, another militia besides the Minmatar made Tier 5 –the Caldari. 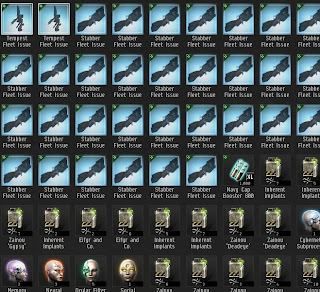 One Caldari player I chatted with during the event sent me a screen shot of his hanger after cashing out his LP. 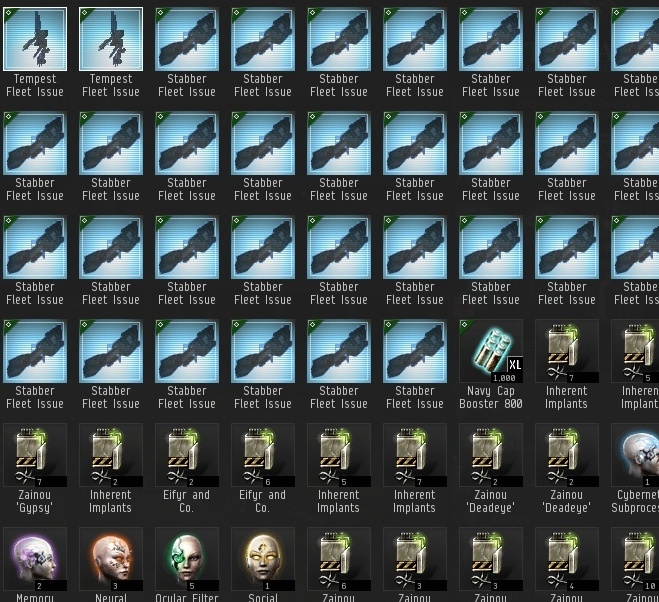 Having been plexing and fighting for months and saving until now, the guy probably had 50 billion ISK worth of items or more. And, he was only one of many. While the Caldari were rolling in Hookbills, implants, and Caracal Navy Issues, the Minmatar were securing all but one remaining system in the Amarr/Minmatar warzone. We now own 69/70 systems –as far as I know, an all time record. Much pressure will be on taking the remaining system, and with the return of several key Minmatar who were absent over the weekend, it will only be a matter of time before the entirety of the warzone is in the Minmatar’s hands. No push was planned between the major groups in the Minmatar, but we long expected that general militia would push this weekend. Without the help of Iron Oxide., Late Night, or other larger Minmatar alliances, general militia pushed the warzone to over 85% control—a Tier 5 lasting hours. The cashout was probably the largest Minmatar cashout to date, and many TLF systems went into TiDi as Minmatar rushed to the LP stores to grab their goods. It was also prime time for suicide ganking. At one point, the TLF station in Hek was so heavily camped by gankers that no one could easily leave the station without getting popped. One Minmatar reported that his alt’s empty hauler was popped in system –meaning the gankers were not even bothering to run ship scanners at that point. With two major pushes happening in a row, the market crashed on many items. Implants and some ships fell significantly below average prices, and ridiculously low buy orders were continuously getting filled. Many people are holding on to items, hoping they will get better prices when the markets adjust. However, they may find themselves waiting a while. With two warzones pushing Tier 5, and the Minmatar in a position to get Tier 5 nearly any time they choose, the market will not recover any time soon. "The cashout was probably the largest Minmatar cashout to date, and many TLF systems went into TiDi as Minmatar rushed to the LP stores to grab their goods." Is this another attempt at lame propaganda to get even more farmers to FW? Then again, what to expect from you. Moron. @Anonymous - What happened today? Your cat piss in your wheaties? Did you select Anonymous because you were too lazy and cowardly to put in your name? Or were you just afraid that, once they saw who it was, people's respect for you would get even lower? Oh wait.. probably would require that people respect you in the first place, wouldn't it? In the meantime, work on leaving your mom's basement and learn to tie your own shoes instead of using velcro. Oh, and don't forget your helmet! I wouldn't want you to hurt your precious brain while you think up a comeback. @Gamerchick - Yeah, over on the Caldari side we had pretty much the same thing going on. Still surprises me how many pilots forget that achieving Tier V is like chuming the water for all the gankers and the market manipulators. wow...not even ship scanning. wow. sounds exciting! I had two different suicide gankers try to get me on the way from Hek to Dodixie. Both failed, which cost the first an alpha 'nado, and the second a Hurricane who couldn't keep my warp stabbed hauler from leaving him for Concord's tender affections. The money was nice, but THAT was easily the best part of my day. Kamela and Lamaa have both fallen and will be returned to the Amarr at downtime. Two other systems show as vulnerable. Sahtogas was stable earlier today. Yeah Agony reclaimed Kamela for Amarr and also Lamaa. I guess it is 67/70 now! Damn them, I was hoping to see what funny jibes and references to PVE CCP might of put on the Minmatar medal. Caldari has been at T5 a few times since inferno, might want to update that.